Most landscape lawns, sports turfs, and golf course surfaces should have reached full green-up but there will be some exceptions. The major exception to this is zoysiagrass turf. 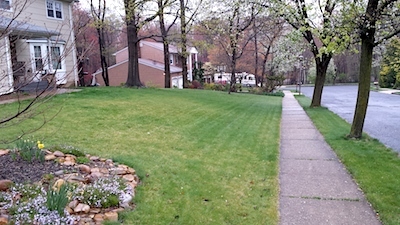 Zoysiagrass will not begin green-up until mid- to late-May. 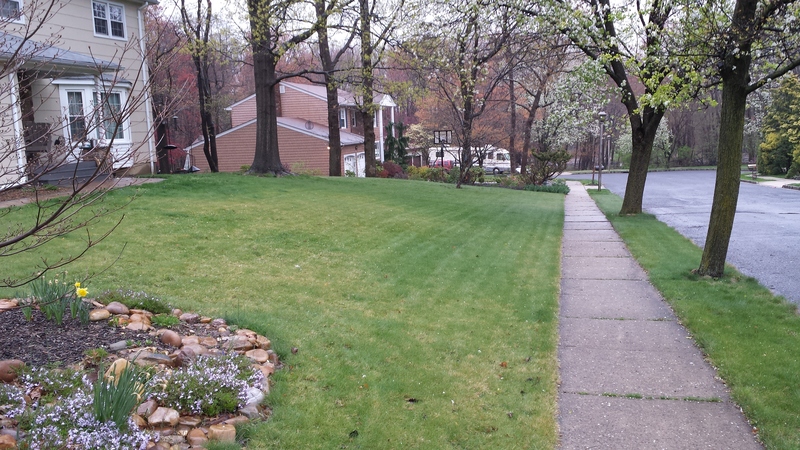 Although not as slow to green-up as zoysiagrass, fine fescue will be slower than perennial ryegrass and tall fescue. Many of the Kentucky bluegrass varieties that are commonly used for sod production will be slow to green-up in the spring. Lawns that are predominately fine fescue lawn should not be aggressively fertilized with nitrogen; do not apply more than 0.5 lb. of N per 1,000 sq. ft. unless the fertilizer contains 30% or more slow release nitrogen. Even with slow release N, applications to fine fescue should not exceed the 0.75 to 0.9 lb per 1000 square feet range during the spring. Over-fertilizing fine fescues could lead to serious summer stress problems including poor heat and drought tolerance. A predominately hard fescue lawn that has not reached full green-up in late April. Avoid over-fertilizing fine fescues to force green-up. Serious summer stress problems could develop. 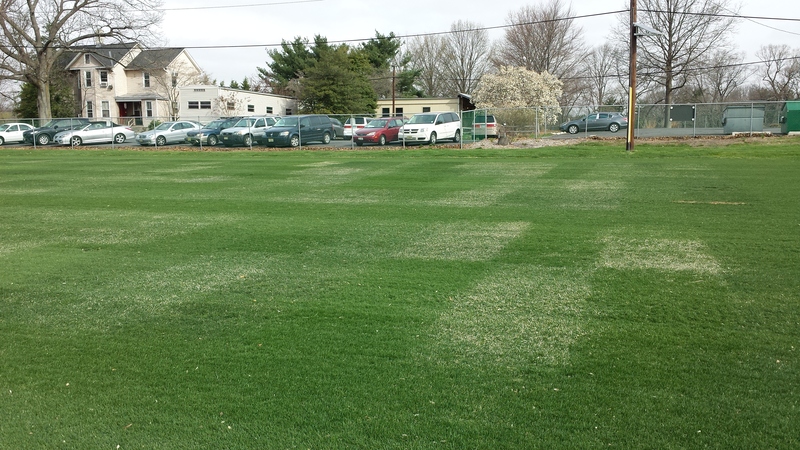 Slow green-up of Kentucky bluegrass can be overcome to some extent with N fertilization. Fertilization in the spring will not cause the same summer stress problems with Kentucky bluegrass compared to fine fescues. But care should be taken to avoid over-fertilization. Over-fertilization problems on Kentucky bluegrass are more likely to be evident over multiple growing seasons rather than a single season. 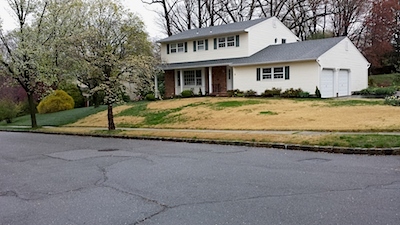 Excessive thatch build-up is the major problem of over-fertilizing Kentucky bluegrass, which typically expresses as a severely drought-sensitive turf (roots are growing in thatch, not soil). The total amount of N applied to Kentucky bluegrass during the spring should be within the range of 0.5 to 1.9 lbs. per 1000 square feet. Application rates above 0.7 lb. per 1000 square feet should include slow release nitrogen to limit surge growth and protect against N leaching. Rectangular plots with a tinge of tan-color are varieties of Kentucky bluegrass exhibiting slow spring green-up (photo taken 18 Apr. 2014).